“Intimidation and total fear were my first reactions,” says the actor, who lives in Weston with her husband, Daniel Gerroll. Kalember succeeds Christine Lahti in the role in popular show, which has an all-female creative and producing team. The play by Emily Mann not only details Steinhem’s personal life and activism with a full cast, but for its second act invites the audience into a “talking circle.” There the ideas of the play continue with conversations, led by Kalember, now as herself and often with a guest to kick off the story sharing — sometimes it’s even Steinem. The actor and her husband worked with the show’s director — Tony Award-winner Diane Paulus, in a play last year at the American Repertory Theatre in Cambridge, Mass., where Paulus is artistic director. “Diane made it clear this was not going to be Nicole Kidman turning into Virginia Woolf in ‘The Hours,’” says Kalember, who adds that in this presentational play, she relies on evoking the spirit of Steinem. 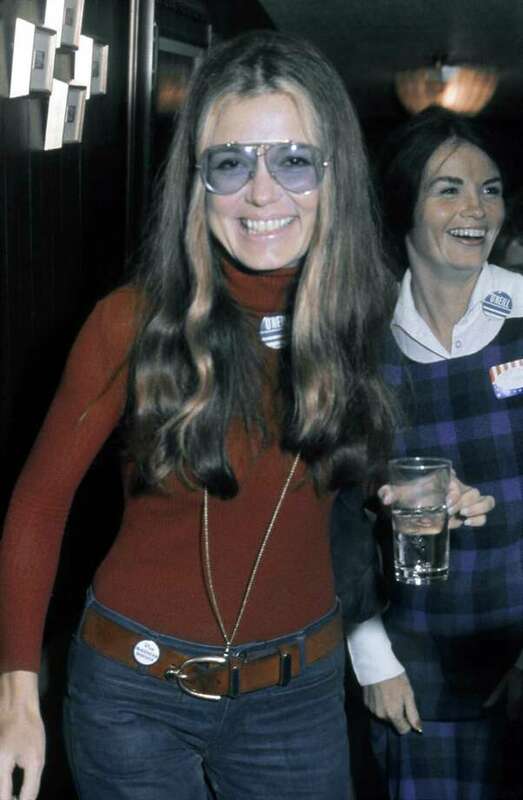 But yes, she’ll be wearing Steinem’s familiar look of the ’70s when she helped launch the feminist movement: Tinted aviator glasses, black bell bottoms pants, large rings and an outsized belt. The casting is a good fit for Kalember, who is known for strong woman roles such as “Georgie” in the popular NBC drama series “Sisters,” which ran from 1991 to 1996, as Susannah in “thirtysomething,” which ran from 1987 to 1991 and as Kate Egan, the force-of-nature mom in the series “Power,” now in its fifth season. Kalember says she did take notes of personal details when she met Steinhem for the first time recently. “The funny thing about Gloria is if you come up to her and say how fabulous she is, she immediately turns the conversation around to you,” she says. Kalember relates to much of Steinem’s beginnings. The actor was born in Schenectady, N.Y., but because of her father’s job at General Electric, the family moved a lot: to Detroit, Louisville and Westport for a few years, and then back to Louisville. In college in the mid-1970s, as the feminist movement was flourishing and an Equal Rights Amendment seemed possible, Kalember was not a subscriber to “Ms.” Magazine, though she followed its progress. “I was not fully ‘woke,’” she admits. When asked about return visits to characters from her two most popular series — “Sisters” and “thirtysomething” — she is not optimistic. And as for a “sixtysomething,” the actors are all involved in other projects and careers other than acting. Still she envisions personally what her character is like now.